With the 17.6-meter-long Canadarm2 firmly holding onto Dragon, the spacecraft will be unberthed from the Earth-facing port of the space station’s Harmony module. Over the next several hours, it will be maneuvered to a release point about 10 meters below the Destiny module. Upon release, the spacecraft will drift away. Following several departure burns, Dragon will leave the 200-meter “keep out sphere” around the outpost. After several hours of drifting way and its orbit lines up with its Pacific Ocean landing zone, Dragon’s Draco thrusters will fire for several minutes to slow the vehicle down enough to enter the atmosphere. Before entry interface, the trunk will be jettisoned as it is not designed to survive the reentry process. 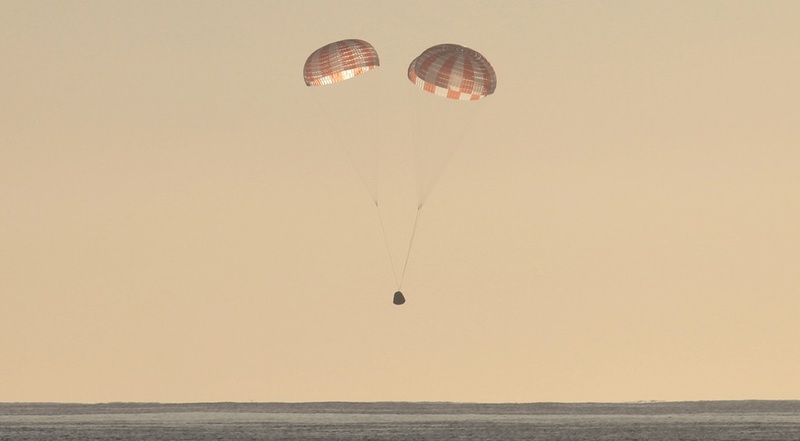 Following a successful reentry, Dragon is expected to splash down in the Pacific Ocean off the coast of Baja California with the assistance of three main parachutes. Once safe in the water, recovery teams will work to place Dragon onto the deck of the recovery ship before transporting it back to the Port of Los Angeles. Time sensitive cargo will then be unloaded and transported a nearby NASA facility. Meanwhile, the capsule will then be prepped for delivery to SpaceX’s test facility in McGregor, Texas, where the remaining cargo will be offloaded and transported to NASA.